17 April 2015 : New Delhi: Suresh Prabhu, Minister of Railways, told the leaders of Indian and foreign companies that it will become easier to do business in India for the next 25 years compared to the previous 25 years. He said that with more entrepreneurship, India will have more growth and with more growth, India will offer more entrepreneurship opportunities. 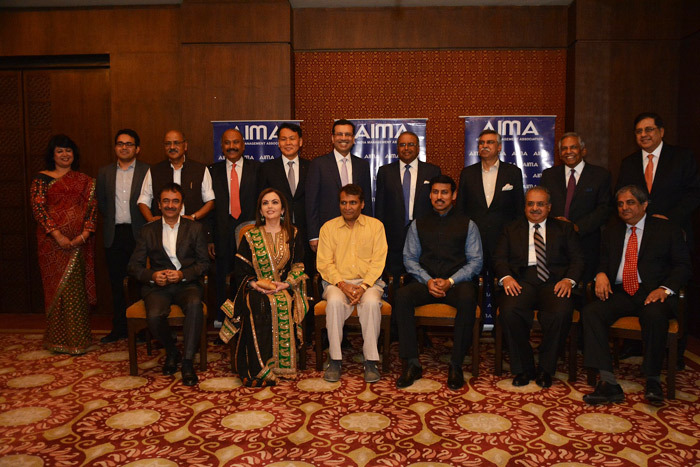 Prabhu was speaking at the AIMA Managing India Awards function in the capital last night. All India Management Association (AIMA), the apex management organization in the country, conferred the 2015 Managing India Awards on seven distinguished individuals and two outstanding companies last night. It was the sixth edition of the awards for outstanding management achievements and contribution to nation building. The awardees were nominated and adjudicated by their peers in the industry. Suresh Prabhu congratulated all the winners and commended AIMA for its contribution to management development in the country. He said that India needed bankers who would lend to the poor and help raise their income, entrepreneurs who would build new kind of businesses, film-makers who would be India’s ambassadors, MNCs that could be considered India’s own and India’s own MNCs that will sell made-in-India products in the best of the markets. He stressed the value of critical journalism in the new India as it could take up unpopular line on issues, something that the politicians could not. Speaking on the occasion, Rajyavardhan Rathore, Minister of State for Information & Broadcast, congratulated the award winners and said that while the awards confirmed the achievements of the winners, those also would inspire others to achieve. “Everybody should give pat on the back to more people because that will encourage other people to do better,” he said. Aditya Puri, Managing Director, HDFC Bank received the Business Leader of the Year Award while Nita Ambani, Founder & Chairperson, Reliance Foundation, received the Entrepreneur of the Year Award. Accepting his award, Puri said that he wished all Indian great prosperity. “In your prosperity lies the prosperity of my bank,” he said. Ambani thanked AIMA for recognizing her entrepreneurship in the social sector and giving a boost to women’s image as entrepreneurs. “Women have the capability to change the world in a better way,” she said. GM Rao, Group Chairman, GMR Group received the Lifetime Contribution Award and M V Subbiah, former Chairman, Murugappa Group, received the Outstanding Institution Builder Award.In his award acceptance speech, Rao expressed gratitude for the opportunities he had got to serve the nation. “We wanted to show the world that Indians could also build great airports,” he said. Subbiah thanked his family for helping him in building the Murugappa Group into a substantial business house. He credited his success to the Arth Shastra mantra of ensuring that nobody one transacts with ever makes a loss. Kunal Bahl, Co-Founder & CEO, Snapdeal.com, was the youngest recipient of the award. He was adjudged the Transformational Business Leader of the Year.Accepting the award, Bahl said that startup leadership was about creating something that makes a massive difference. “We’ve a great opportunity to create thousands of successful online entrepreneurs in the country,” he said. Sun Pharmaceutical Industries won the Indian MNC of the Year Award, which was received by its Founder & Managing Director, Dilip Shanghvi.Shanghvi said that the AIMA award would encourage Sun Pharma to become a true multinational with global presence, as it was predominantly an Indian company doing business in a large number of countries. The awards for exceptional achievements in the media and entertainment categories went to Shekhar Gupta, Contributing Editor, India Today and Rajkumar Hirani, film writer, director and producer. Shekhar Gupta received the Outstanding Contribution to Media Award and Rajkumar Hirani received the Director of the Year Award. Accepting the award, Hirani said that he was particularly pleased to be felicitated for making PK because he had taken the risk of making a film that challenged the popular sentiment. Gupta said that journalism had become more challenging than ever because of the trend of imputing motives to every story one did or did not do. “All survivors in journalism deserve lifetime awards for their thick skins as they have to wait until they are proven right,” he said. All India Management Association (AIMA) is the national apex body for management in India. Over the last five decades, AIMA has contributed immensely to the enhancement of management capability in the country. AIMA has a broad base of 62 Local Management Associations including two cooperating LMAs abroad, with a membership crossing 30,000 in number. AIMA is a non-lobbying organisation, working closely with Industry, Government, Academia and students to further the cause of the management profession in India. AIMA is represented on the Boards of India's premier Business Institutions like Indian Institute of Management – IIMs. AIMA is also represented on Boards of Government bodies including the All India Council for Technical Education, National Board of Accreditation, National Productivity Council to name a few. AIMA makes a salutary contribution to management learning and practice in the country by offering various services in the areas of testing, distance education, research, publications and management development programmes.